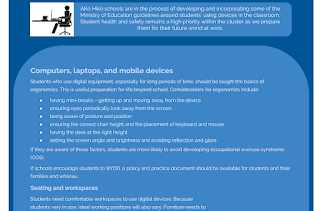 In response to some questions at the end of 2016, the Ako Hiko cluster has begun to incorporate the advice from the Ministry of Education (via TKI) around students' physical positions when using devices. There's not much out there, but using the support of TKI, we've developed a cluster specific document to view and download. Click here to view it. The information is also embedded directly into the cluster website here. Click on the image to access the page if the link does not work. Within the Ako Hiko cluster, we focus on providing safe settings for students to learn within and this includes their device usage. The key thing to remember is 'the next position is the best position.' Moving regularly sand finding different ways to work will avoid eye strain and working in an uncomfortable position for too long. Below is a short video about ergonomics while using devices. Although created in 2011, it is still very much relevant to today's classrooms.